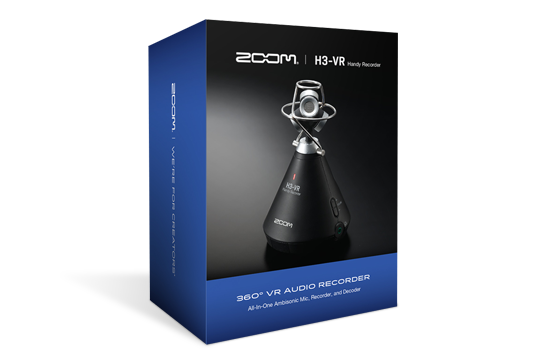 ZOOM H3-VR VR AUDIO, YOU'VE ARRIVED. Whether you’re a game developer, filmmaker or musician, virtual reality is the undeniable future of content creation. While 360-video is exploding in popularity, the ability to easily create 360-audio has lagged behind…until now. Whether you’re a gamer, filmmaker or musician, virtual reality is the undeniable future of content creation. While 360-video is exploding in popularity, the ability to easily create 360-audio has lagged behind…until now. 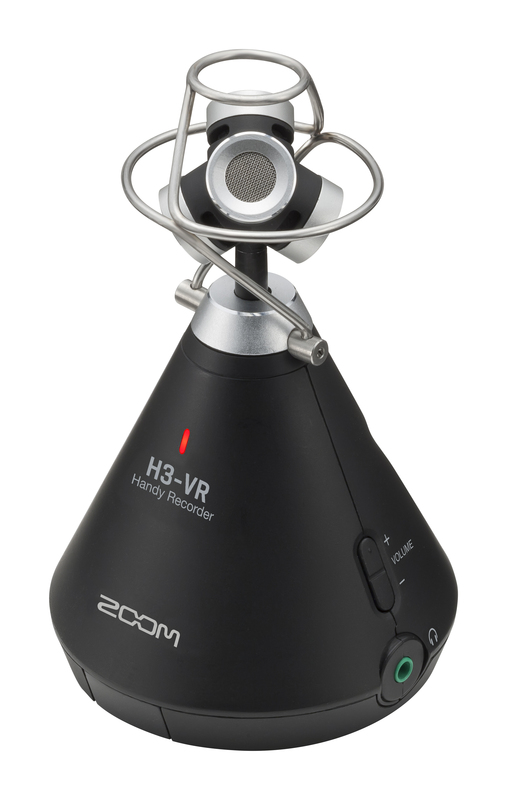 The Zoom H3-VR virtual reality audio recorder is the complete solution for capturing and processing spatial audio for VR, AR and mixed-reality content. With a built-in Ambisonic mic, recorder and decoder, the H3-VR puts 360-audio in the palm of your hand. In the past, capturing VR audio required a dedicated Ambisonic mic, a separate recorder and a computer for encoding the audio from raw Ambisonics A format to VR-ready Ambisonics B format. Now, with the H3-VR, all of the encoding and decoding is done on board, saving time, money and effort at every step. The H3-VR’s 4-capsule Ambisonic mic captures precise 360-degree VR audio recordings up to 24 bit/96 kHz. And without ever connecting to a computer, the onboard decoder allows you to export Ambisonics B-format files directly. The H3-VR also records stereo binaural WAV files up to 24 bit/48 kHz. Stereo binaural provides a hyper-realistic spatial recording that enhances 2D productions with 3D audio. The H3-VR even offers standard stereo recording for recordings that will be played out of speakers rather than headphones. Free to download, ZOOM Ambisonics Player software can easily convert Ambisonics audio to a 5.1ch surround file that is pre-aligned to the proper speakers, and is exported to your video or audio editor for syncing with standard video. The H3-VR also enables you to live stream events in 360 degrees so that wherever your fans are, they’ll have access to the best seats in the house. The H3-VR’s compact, conical design captures audio from multiple angles without getting in the way of the camera or the action. Auto Mic Position and Level Detection make placing the H3-VR simple. Whether positioned upright, upside down, endfire or endfire inverted, the H3-VR automatically calibrates so your audio and video are already aligned for post. The slam of dungeon doors, growl of monsters or howl of the wind can make or break a player’s fantasy. With the ability to capture high-quality in-game audio, you can elevate your player’s experience to new levels. The H3-VR’s line out volume control lets you adjust the output volume to a DSLR camera, additional headphone, etc. A dedicated headphone jack allows for stereo binaural monitoring of your audio while recording. A directionally-responsive LCD screen provides a bright, clear display even when upside-down. The Home, Play/Pause, Forward, Reverse and Menu buttons are positioned for quick access. Lock your settings on the H3-VR while recording using the unit’s Hold function. The H3-VR’s highly accurate internal clock with 0.5 ppm discrepancy reduces audio/visual drift. Using the slate tone enables you to easily calibrate the H3-VR and camera audio levels. Use the sound marker to output a tone when recording starts to make syncing audio and video easy. The H3-VR features a built-in limiter to prevent clipping and distortion during your most dynamic moments. The H3-VR’s adjustable low cut filter removes unwanted low-end frequencies. With the single-knob gain control, you can easily adjust the gains of all four mic capsules simultaneously for accurate, balanced 360-degree audio. Two AA batteries can power the H3-VR for over 11 hours. For longer shoots, the H3-VR can also use portable USB batteries or be plugged in via an AC adapter. The H3-VR fits right in with your existing gear, featuring a dedicated line out for a wide range of 360 cameras or other external devices. 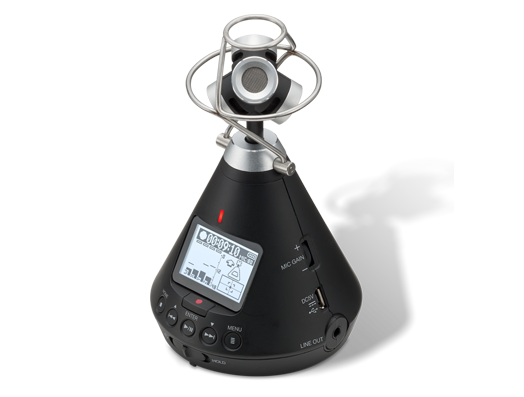 Weighing less 5 ounces (120g), the H3-VR is the perfect Ambisonics recorder to take on the go. And since H3-VR records directly to a microSD card, there’s no need for external gear. 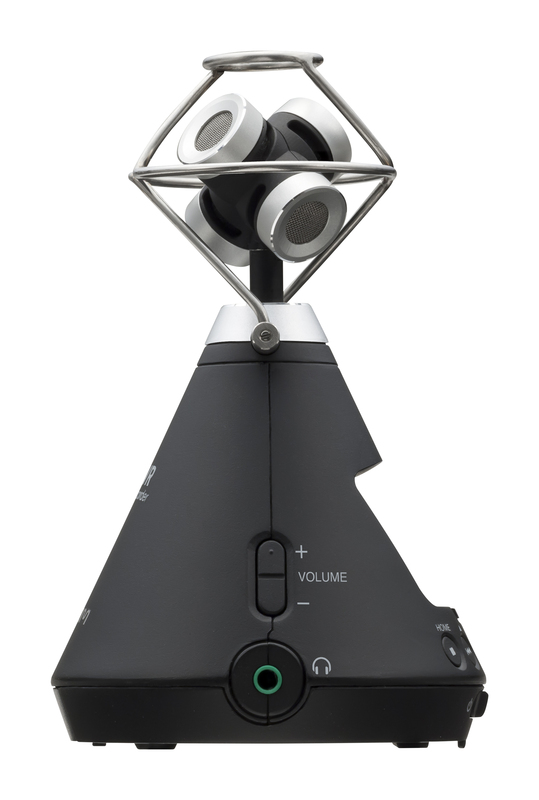 Weighing less 5 ounces (120g), the H3-VR is the perfect Ambisonics recorder to take on the go. And since H3-VR records directly to an SD card, there’s no need for external gear. 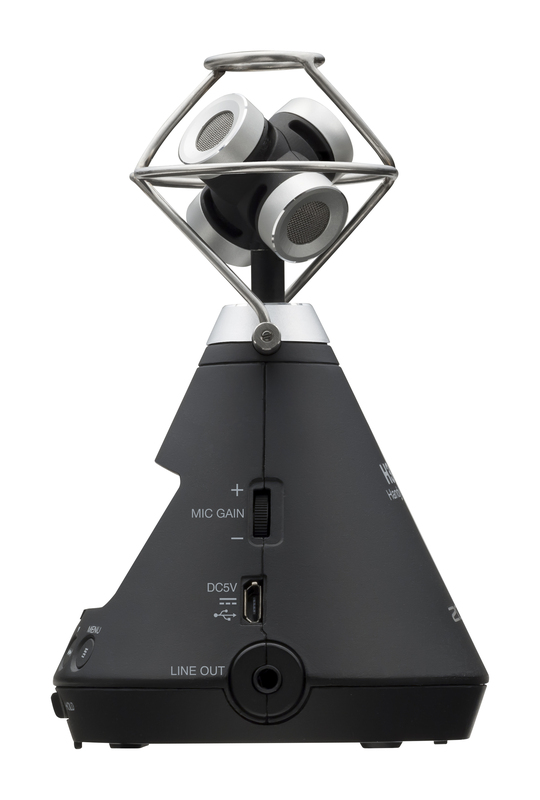 Monitor your audio live in stereo binaural or use the H3-VR’s onboard Ambisonics Decoding to simulate your recorded 360-experience during playback. 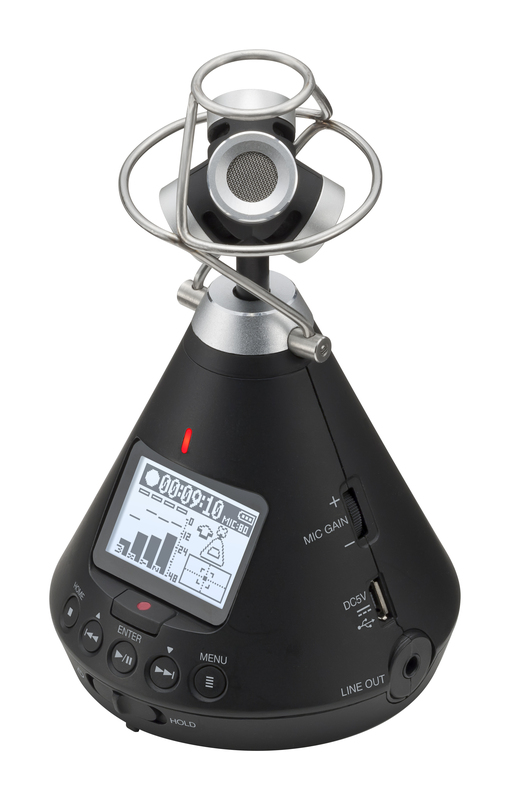 Perfect for live streaming, video conferencing, direct recording and more, the H3-VR’s audio interface mode turns it into a USB 360 mic for your computer or stereo mic for your iOS device. 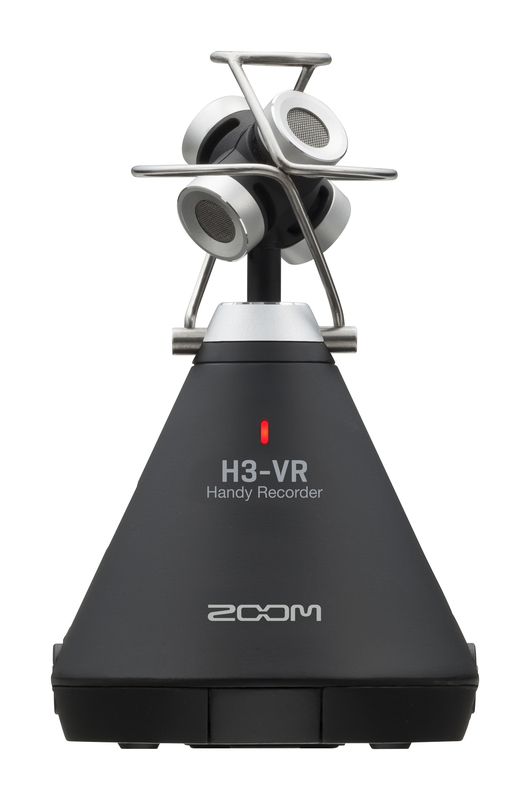 The H3-VR’s companion ZOOM Ambisonics Player software takes the work out of post-production by easily converting your Ambisonics files to Stereo, Binaural, 5.1ch surround and more. Play, trim, re-orientate and export your audio files in minutes. • The above values are approximate. • Continuous battery operation times were determined using in-house testing methods. They will vary greatly according to use conditions.